2. Compile the app by going to Build->Build Solution. 3. Run the app in the Local Machine from the Toolbar. The following diagram shows how the Windows Store app looks like. The sample is based on the Visual Studio Split App template. It basically allows a barcode symbology to be selected on the left and automatically generates the barcode on the right panel. 4. Stop the app by going back to Visual Studio. Go to the Solutions Explorer->Fonts folder. This folder contains the True Type Barcode Fonts (*.ttf) embedded in the app. 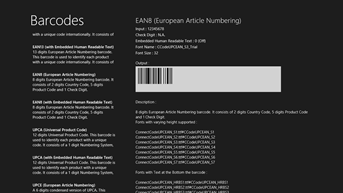 It is important to note that not all barcode fonts available in ConnectCode software package are embedded to this sample app. If a different font is required, simply add the font from the software package into this folder in Visual Studio. The app itself also describes the different barcode fonts available. The library scripts can be found in Solution Explorer->barcodes folder. Basically the process involves setting a specific barcode font and using the scripts to encode the barcode. Note : Refer to the software Help file for the complete Application Programming Interface (API).